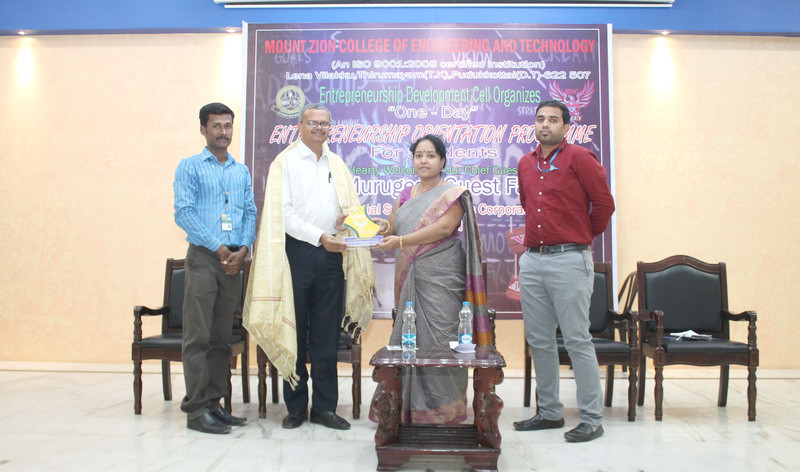 The Entrepreneurship Development Cell (EDC) of Mount Zion College of Engineering and Technology was established on its own initiative in the year of 2012, with a vision for fostering innovation and promoting entrepreneurial spirit among the budding Engineering students. The Entrepreneurship Development Cell provides a platform for the budding entrepreneurs to learn about entrepreneurship and enhance their skills. The academic institutions play a vital role in the economic development of a country as they produce the right manpower needed by different sectors of the society. The focus is on urging the students to think out of the box and it strongly believes in the concept of Live the Dream and also hope to spread this message among the student community to make them realize that there is Life beyond job seeking. In the present economic scenario we are functioning with this slogan Dont be a job seeker, try to be a job provider. Identifying entrepreneurial opportunities inside the college campus such as project development centers, student cooperative stores and business stalls etc. Organizing the idea hunter and business plan competitions every year. Encourage the students to participate in competitions and programs related to entrepreneurship development activities. Conduct programmes to empower women entrepreneurs. Arranging interactions with Entrepreneurial Development Institutions relating to financial and other assistance.